There are two crawler-transporters used by NASA, and today they carry space shuttles — boosters and all — along with each shuttle's Mobile Launcher Platform into position. 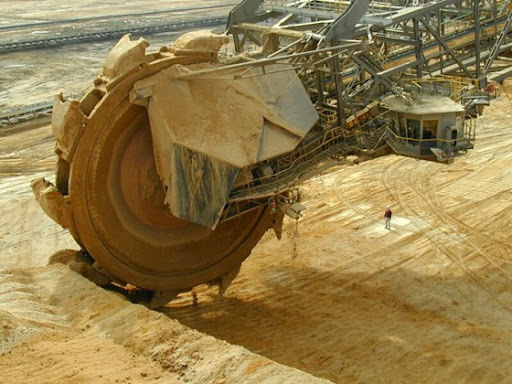 While not as large as the Bagger 288 above, the crawlers are the largest self-powered vehicles in the world, and can manage two miles per hour (compared to the Bagger's 30-some feet a minute) when unloaded. The name of that epic structure is Overburden Conveyor Bridge F60 in Lichterfeld. 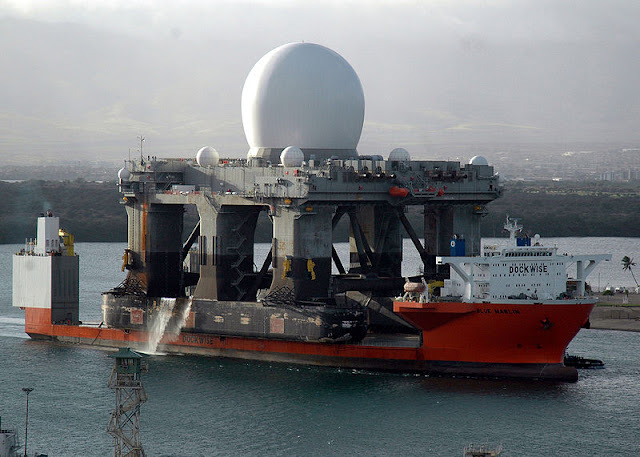 This technological steel giant is 502 metres long, 202 metres wide, 80 metres high and 11,000 ton heavy. It was build in East Germany in 1991 by VEB TAKRAF Lauchhammer (although the GDR was manufacturing slightly lesser types since 1958). After only 13 months of operation the F60 bridge was taken out of operation for energy-political reasons. The opencast mine Klettwitz-Nord where the conveyor bridge was operating is closed. The bridge is owned now by the community and presented as the "Lying Eiffel Tower." 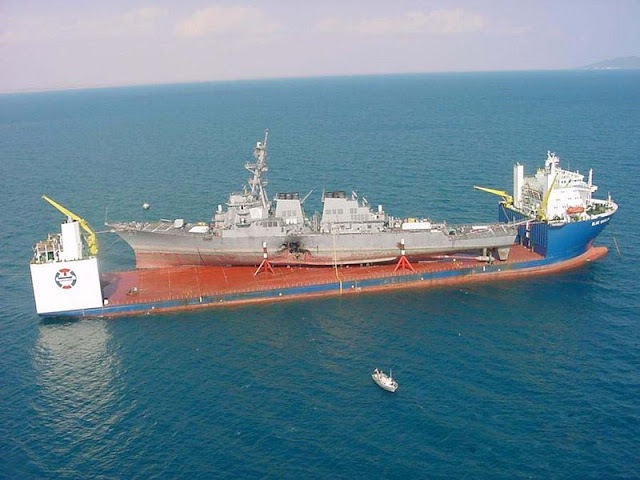 A sheerleg is a floating crane, but compared to crane vessel it is not capable of rotating the crane separate from the ship. With its 8700 tonnes lifting capacity, Svanen is the most powerful floating crane in the world. The Most Powerful Mobile Crane in the World… and actually a monster of a truck. Meet Liebherr LTM 11200-9.1 – Built by the German company Liebherr Group, this colossal mobile crane has the longest telescopic boom in the world – 100 meters (328 ft)! The massive boom is in eight parts and is longer by 16 meters and stronger than the previous worlds greatest mobile crane the 1998 model LTM 1500-8.1 which had a boom of only 84 meters. 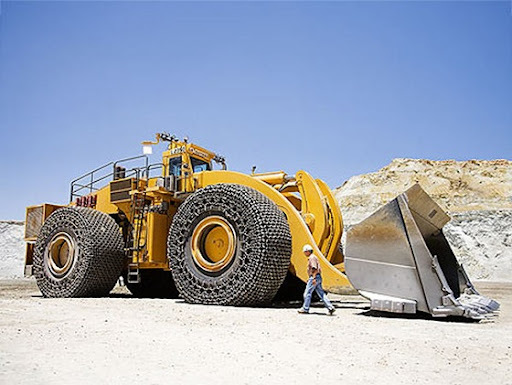 When the Terex 33-19 "Titan" prototype was built in 1973, it became the largest, highest capacity haul truck in the world, a distinction it would hold for the next 25 years. The 33-19 "Titan" was an off-highway, ultra class, rigid frame, three-axle, diesel/AC electric powertrain haul truck designed by the Terex Division of General Motors and assembled at General Motors Diesel Division's London, Ontario, Canada assembly plant. Only one 33-19 "Titan" was ever produced. After 13 years in service, the 33-19 "Titan" was restored and is now preserved on static display as a tourist attraction in Sparwood, BC, Canada. The Titan was powered by a 16-cylinder 3,300/3,000 horsepower (2,500/2,200 kW) locomotive engine with a displacement of 10,343 cubic inches (169.49 l) coupled to a EMD AR10-D14 generator. This Electro-Motive Division engine, as the 16-645E4 prime mover, was intercooled and turbocharged. The generator then powered 4 electric traction motors, one at each rear wheel. The Terex featured large 40.00x57 tires made of rubber. 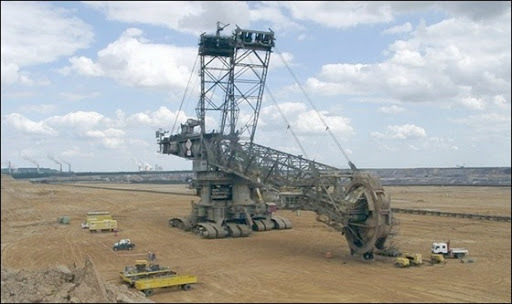 It is 66 feet (20 m) long and 22.6 feet (6.9 m) tall; or 56 feet (17.1 m) tall with the dump body raised. 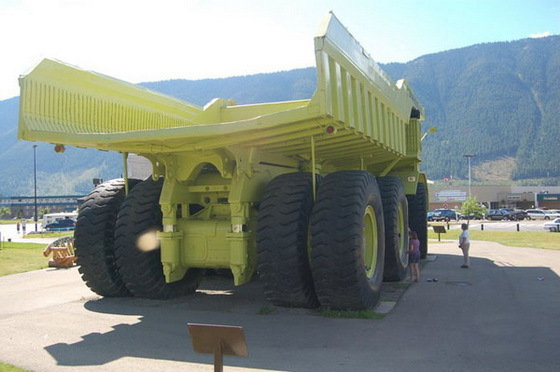 The L-2350 loader from LeTourneau Inc. holds the Guinness World Record for Biggest Earth Mover. Designed to center-load haul trucks with capacities of up to 400 tons, the L-2350 provides an operating payload of 160,000 pounds, a 24-foot lift height, and an 11.5-foot reach. When it comes to bulldozing, bigger really is better. The bigger the dozer the more efficiently they work and the more aggregate they can shove. 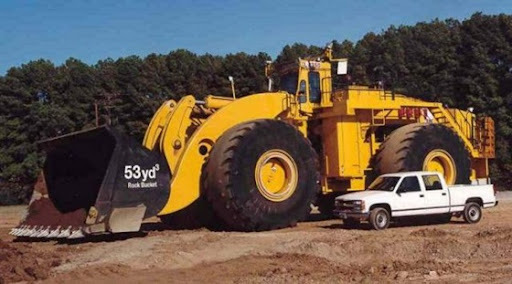 The World's biggest and most powerful (production) Bulldozer is the D575A-3SD built by Komatsu in Ishikawa, Japan. Standing 16 feet tall, 41 feet long and 24 feet wide the D575A-3SD is the king of power when it comes to shifting aggregate. When the need arises to clear away large amounts of rubble, rock or earth then the D575A-3SD is the machine of choice. 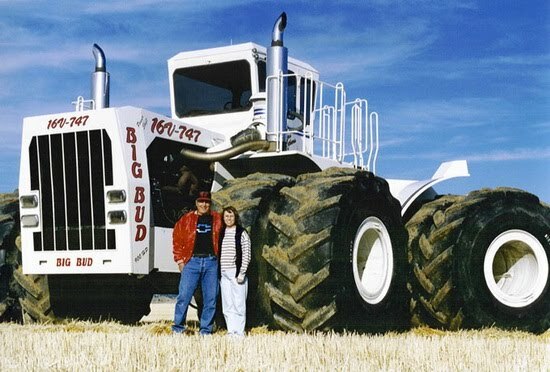 In 1977 the Big Bud 747 tractor was built in Havre, Montana. The tractor was built by Ron Harmon and the crew of the Northern Manufacturing Company. The tractor was built to produce 760 horsepower using a 16-cylinder Detroit Diesel engine. 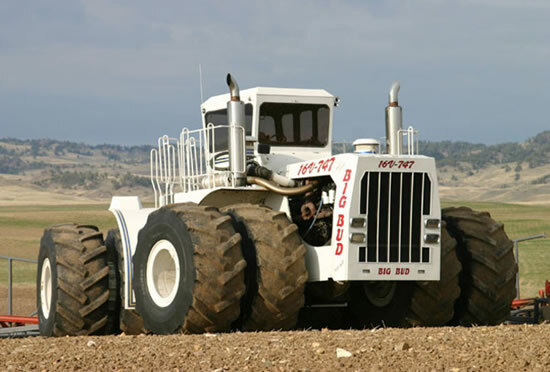 The tractor measures 27 feet long, 20 feet wide, and 14 feet tall. 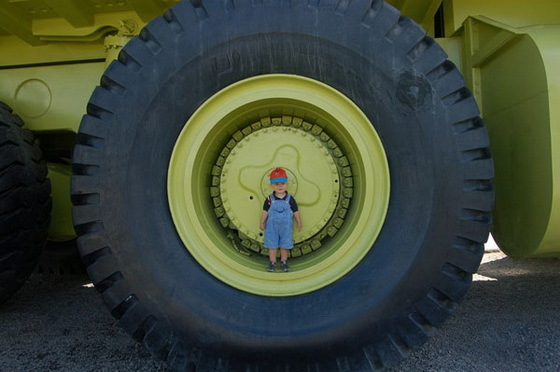 The tires were specially made by United Tire Company of Canada and are 8 feet in diameter. When the 1,000 gallon fuel tank is full the tractor tips the scales at over 100,000 pounds. Generally acknowledged as the largest airplane in the world, the Antonov An-225 Mriya (dream) is the world's heaviest aircraft ever (max. 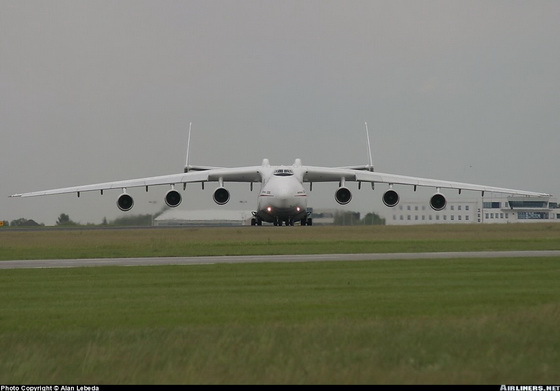 takeoff weight greater than 640 tons) and the largest aerodyne (in length and wingspan) ever entering operational service. 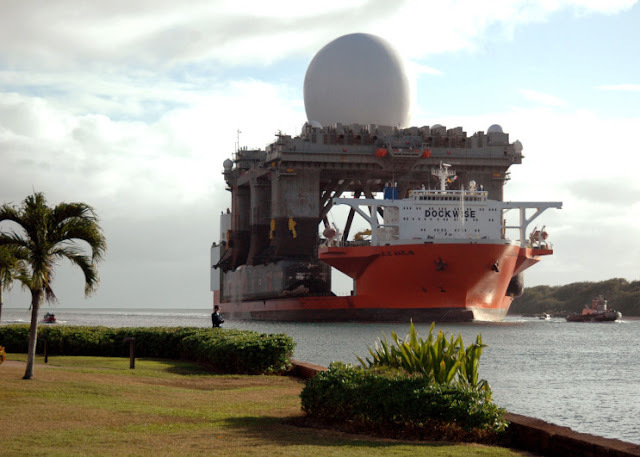 MV Blue Marlin and her sister ship MV Black Marlin comprise the Marlin class of semi-submersible heavy lift ship. They were owned by Offshore Heavy Transport of Oslo, Norway from their construction, in April 2000 and November 1999 respectively, until 6 July 2001, when they were purchased by Dockwise Shipping of the Netherlands. 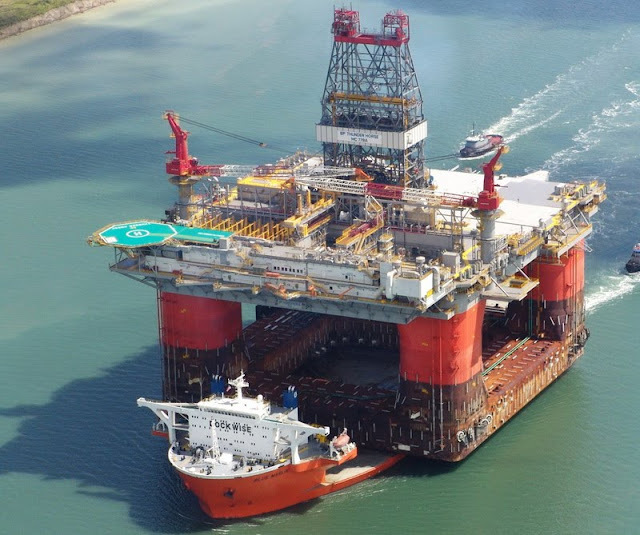 They were designed to transport very large semi-submersible drilling rigs, which can weigh 30,000 tons and have a center of gravity around 30 meters (100 ft) above the transport ship's deck. The Marlins are equipped with 38 cabins to accommodate 60 people, a workout room, sauna, and swimming facilities.